Starting a home library for your child shows him/her how important books are. 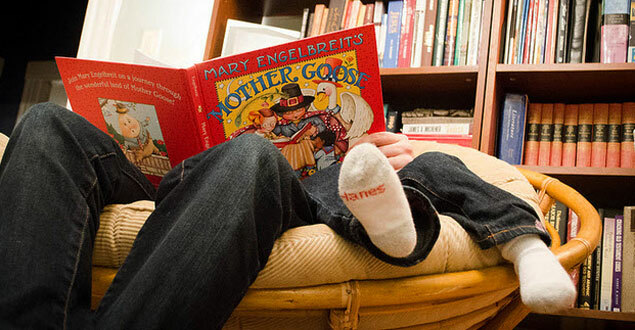 Having books of his/her own in a special place boosts the chance that your child will want to read even more. Here are some ideas for creating your own home library. Don't forget quality nonfiction and children's magazines! A cardboard box or small wooden packing crate that you can decorate together might make a good bookcase. Or you might clear one of the family bookshelves. Pick a special place for your child's books so that she knows where to look for them - in a cozy corner of your child's bedroom or close to where the rest of the family gathers and reads if your child is very social. Help your child to arrange her books in some order - her favorite books, books about animals, or holiday books. Use whatever method will help her most easily find the book she's looking for. "This book belongs to…" Bookplates give your child a sense of ownership and can add "newness" to a used book. You can make your own or download and print one of these colorful designs by children's book illustrators. If you and your child make your own books together, you can add those to your home library. Borrow books from your local library. Go to the children's section and spend time with your child reading and selecting books to take home and put in her special spot. You might even have a box or space just for library books, so that they don't get mixed up with your child's own books. When collecting and reading books are a part of family life, you send your child a message that books are important, enjoyable, and full of new things to learn! Love your page!! As an Educational Consultant I think it is so important to have amazing books at home to compete social media and online activities!! Need great books at every age and don't stop reading aloud to your teens!! Thanks for a great site!